Download "own.zip" from below, extract it and double click on "own.reg". It will add a new entry to your registry which will allow you to right click on any file you want to own and click on "Take Ownership". To remove "Take Ownership" option from the right click menu, simply double click on "own_rem.reg". Start button > All Programs > Accessories > Right-click on Command Prompt > Select Run as administrator > Click Continue. 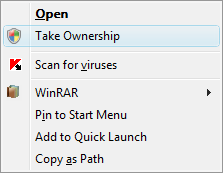 Or you can use this tool: Take Control, if you are afraid to play with registry files. The tool has been made by WinMatrix members XPero to take ownership and get full control of any system file with ease. Now this makes thing much..much easier Thanks! Thanks man, it will save me a lot of clicking and time. I'm using XPero's Take Control. It's working flawlessly. does it work with any version of Vista?? Spanish for example. Take Control works for me. Give it a try. thank u very much. just one more thing if i select 'No GUY boot' to modify the boot manager i get a small notification from windows defender that some start up program has been blocked. how could i avoid this notification? and which file has to take ownership to replace that boot screen downloaded from ur post? Very useful tweak! Awesome! Thx! the problem i'm having is that my windows is in german, so that your installer file can't find the folder "program files", but only "programme". i wanna take controle of WMP 12 files, to downgrade to WMP 11.
i dont understand that programm who can help me please. Edited by baron75mk2, 22 January 2010 - 03:31 PM. Forgive me, but i need help. I'm running Windows 7 64-bit and i followed all your instructions but still was not able to downgrade WMP12 to 11. I'm having problems taking ownership of the files found in the System32 folder and en-US folder but was successfully able to take ownership of the files in the WMP in the Program Files folder. any ideas on what might be my problem?? or is it really just not compatible for x64 systems? Yup, same here. I'm also on the 64 bit version of Windows 7. Taking ownership of the Windows Media Player folder in 'Program Files' and 'Program Files (x86)' was a breeze. It was also easy to do the same thing in the system32 folder. But this system32 folder shows that I have ownership and the permissions, but does not act like I have ownership and permission. It says I do, but I really do not. Any ideas as to what might be causing this? Man, Windows Media Player 12 is annoying.. I tried following the instructions, but when I ran the installer it kept complaining about "can't copy this file(various files, about 15 of them)". So, it didn't work. What could I have done wrong?